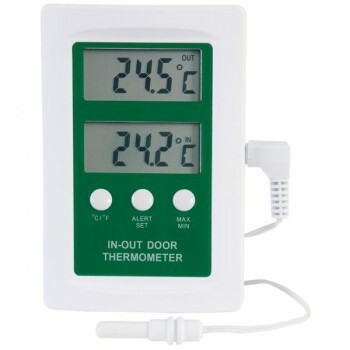 ETI 810-080 In/Out Thermometer is to allow you the ultimate flexibility, the thermometer displays not only the current temperature of your desired location but also the minimum and maximum temperatures that your room, fridge or freezer has reached. This allows you to ensure that safe storage conditions have not been breached. You can also set an alarm to alert you of any change in temperature that exceeds your set parameters (out cable only). Supplied with a 3m cable (in), you can position the main unit in a convenient location for viewing whilst the main sensor remains in the room or fridge that you wish to monitor. Second time I have used Thermometers Direct. Simple, hassle-free quick service. Would recommend. Does exactly what I wanted it to do. Measure top of hot water tank temperature as Solar Water only measures bottom of tank and CH system middle of tank. How do you know if water hot enough? - result fit this superb thermometer. External cable long enough and having separate plug means can be wall mounted AND you can get to change the batteries. Excellent item, delivered within 36 hours by ordinary post. Thank you. This item arrived quickly and works well. I would buy from here again. This is now the3rd time that I have dealt with Thermometers Direct & have to say what a great service they provide. The thermometer that was ordered arrived the next day, well packaged & in perfect working order, thank you!